Choosing an effective mounting medium is especially important for immunofluorescence imaging. Fluorophores are susceptible to photobleaching and fading from the imaging excitation light, handling, and during storage. Vector Laboratories is a market leader for mounting media that provide excellent signal retention for image acquisition and specimen archiving. This diagram features established applications for our antifade mounting media formats. VECTASHIELD Antifade Mounting Media are widely utilized to protect the inherent fluorescent properties of traditional and contemporary fluorophores in many applications using epifluorescence and confocal microscopy. The versatility of the original VECTASHIELD format solves the demands of labs and core facilities using multiple platforms and fluorescent markers. 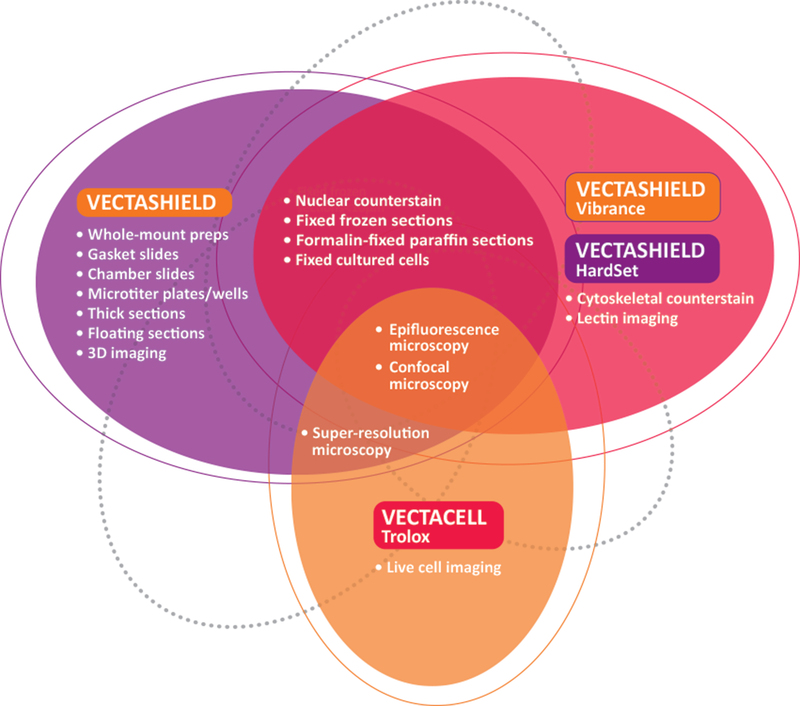 Furthermore, VECTASHIELD reagents are also recognized as leading media in emerging techniques such as super resolution microscopy (SRM). VECTASHIELD Mounting Media are the most widely referenced antifade mounting media for immunofluorescence applications. Currently, over 60,000 published references cite using VECTASHIELD Mounting Media and describe compatibility with over 130 fluorophores and fluorescent markers. This data underscores the prominence of VECTASHIELD reagents in this application. The graphic above highlights the most commonly references fluorophores used in combination with VECTASHIELD Antifade Mounting Media.